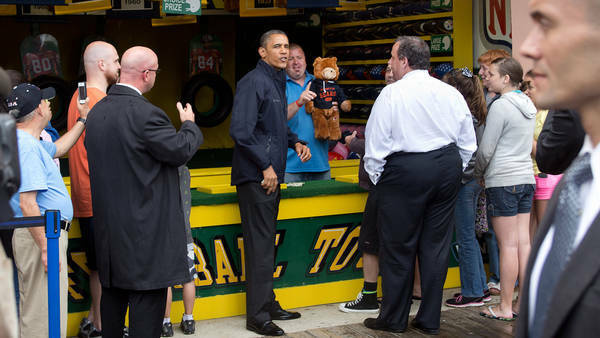 Obama and Christie: Moderate Friendship: On the Jersey Shore, Gov. Chris Christie’s friendly welcome toward President Obama suggested he cared little about the Republican criticism that haunted a similar visit last fall. By MICHAEL D. SHEAR and MARK LEIBOVICH POINT PLEASANT BEACH, N.J. — Politics makes strange beachfellows. President Obama and Gov. Chris Christie of New Jersey affirmed this notion, and enjoyed its benefits, on Tuesday, in a drizzly reunion on the Jersey Shore, seven months after Hurricane Sandy punished the famous coastline and united them in an unlikely political partnership. Re-elected yet freshly embattled, the president was making his first visit here since the storm scrambled the final days of the 2012 presidential campaign. As he did in October, the now-surgically thinner governor received Mr. Obama with unrestrained gratitude, showing no hint of the partisan pit-bull tendencies that would define the captured-on-YouTube persona of his first term. At one point, the pair took an unannounced stroll down the Point Pleasant Boardwalk before stopping at an arcade so Mr. Obama could try to win a teddy bear by throwing a football through a tire, in a game called “Touchdown Fever.” After a few misses, Mr. Obama seemed headed for another public athletic calamity, adding to a litany that includes a string of botched basketball free throws on the White House court last month, a horrifically ugly first pitch at a Washington Nationals game in 2010 and a display of bowling incompetence in Pennsylvania during the 2008 Democratic primaries. But before the football tosses on Tuesday spiraled too far out of control for the president, Governor Teddy Bear himself stepped in and promptly split the rubber on his first try, earning a high-five from the First Beach Buddy. “One and done,” Mr. Christie boasted, while the guy behind the counter presented Mr. Obama with a fuzzy “Chicago” bear, which he hoisted for the cameras. It was good times, good optics and a keepsake for both men’s political photo albums: for Mr. Obama, a snapshot from a rare bipartisan partnership that has actually worked, and for Mr. Christie, proof that he stands apart from the kind of ideological rigidity that could alienate large swaths of the Democratic-leaning electorate of New Jersey, where he is seeking a second term. For his part, Mr. Christie has fashioned a potent political brand as a no-nonsense leader, whose clarity in a crisis can transcend the tired niceties and rivalries of the partisan game. The president has served as a ready foil, and, more to the point, a provider of the kinds of tangible goods (money, resources and a friend in the bully pulpit) that can be political gold after a disaster, particularly in the blue-leaning state where he is up for re-election. On a basic level, the visit provided a hopeful, even enjoyable venue for both men to show off their boardwalk bona fides. Despite a persistent rain, the scene contrasted with the grim spectacle Mr. Obama and Mr. Christie surveyed last October as they toured the hurricane’s wreckage. They worked a rope line along the Boardwalk, which had been partially damaged by the storm. They talked to a local sand sculptor who is trying to build the world’s largest sand castle, an effort to draw attention, and tourists, back to the shore. Later, at an event on the Asbury Park Boardwalk, Mr. Obama and Mr. Christie urged Americans to visit the restored beaches even as they acknowledged that, for many homeowners, the devastation lingers. “We all understand there is still an awful lot of work to be done,” Mr. Obama said. The event seemed every bit the walk on the beach that it actually was for both men: Grin, grip, hug, mention Bruce Springsteen and move on. “I played a little Frog Bog,” Mr. Obama said at the Asbury Park Convention Hall. “And Governor Christie’s kids taught me the right technique for hitting the hammer to get those frogs in the buckets the way I was supposed to.” He also said, of course, that he met with people who are trying to rebuild after Hurricane Sandy. Mr. Obama played the “Touch Down Fever” game on the boardwalk. Politically speaking, Mr. Christie needed to walk a careful line. If he seeks the Republican nomination for president in 2016 and appears to be too friendly with the president, his Republican rivals could use it against him. But that chumminess could come in handy when it comes to winning over swing voters, if he becomes the party’s nominee. Mr. Christie’s likely Democratic opponent, Barbara Buono, a New Jersey state senator, issued a statement on Tuesday criticizing the Republican governor for saying last week that he doubted that Hurricane Sandy was the result of climate change. Mr. Christie has also been criticized in his state for appearing with his family in a television commercial that was paid for with storm recovery money. The commercial is intended to promote the shore, but Democrats have argued that it is little more than a thinly-veiled campaign ad for the governor, who is up for re-election in November. For the moment, the trick for both men was to appear as if they do not care about the politics. CHICAGO (CBS) – A 3rd grader from the South Side has become an Internet sensation, after delivering a rousing speech at a rally against school closings earlier this week. WBBM Newsradio’s Bernie Tafoya reports there have been more than 88,000 views on YouTube of 9-year old Asean Johnson speaking at the podium for nearly three minutes on Monday at a protest rally in Daley Plaza. He might be pint-sized, but Asean had no problem standing up to Mayor Rahm Emanuel and Chicago Public Schools CEO Barbara Byrd-Bennett. He was fighting to keep open Marcus Garvey Elementary School, which was one of the four schools given last minute reprieves on Wednesday when the Board of Education voted to close 49 other elementary schools. Afterward, some talked of him running for mayor in 2025, when he’s 21 years old. Parents had a gut-wrenching choice, and only a few minutes to make it. Trust the safety of the seemingly solid school buildings and the protection of trained teachers and staff. Or drive frantically ahead of a massive tornado and attempt to take their children safely home. “Something clicked in my head and said that my children would be afraid and they would be safer with me,” said Amy Sharp, who jumped in her pickup, peeled off through pounding rain and hail, and pulled her 10- and 12-year-old daughters out Plaza Towers Elementary School. Sharp survived with her children. But seven of the many remaining students died when the twister ripped down the school’s roof and walls. Exactly how do desperate parents like those in the path of the powerful Oklahoma tornado know when it’s best to leave their children in a presumably safe place or race into the face of danger? “You have that parent-child draw. That protective factor, where they want to go at any cost, no matter what. The options aren’t very good in a tornado if you’re thinking about going to rescue your children,” said Ronald Stephens, executive director of the National School Safety Center that provides training to schools around the country. “Which way is the wind going to twist? What’s it going to pick up? What won’t it pick up? Until someone becomes all-powerful, all-knowing and all-perceiving, it is tough to expect 100 percent perfection from schools and parents,” he said. The Oklahoma tornado provides a good example of the unpredictable death toll that disasters can inflict. Before it flattened Plaza Towers Elementary, the tornado also tore through Briarwood Elementary and — though the roof collapsed — everyone at Briarwood appears to have survived. Both schools lacked tornado safe rooms, and at both, students initially were sent to the halls before some teachers squeezed them into seemingly safer places such as closets and bathrooms. David Wheeler would have liked to race to have rescued his 8-year-old son, Gabriel, before the tornado reached Briarwood. But Wheeler had to remain at a separate school where he worked. So he waited until the tornado cleared, then sped down the highway as far as he could and fibbed about being a first-responder so he could hitch a ride with a sheriff’s deputy headed into the disaster zone. Once he got there, he slogged through broken glass and raw sewage to try to get to the school. Wheeler ended up more injured than his son, who climbed from the rubble with scrapes and bruises after being sheltered by a teacher. Wheeler, meanwhile, had a large red rash on his legs — he thinks from the sewage — and multiple cuts and scrapes that required him to get a tetanus shot Tuesday. “It was just kind of a surreal moment. I didn’t know if my son was alive — it was the worst moment of my life,” Wheeler said. Stephens, a former school administrator who lives in Westlake Village, Calif., said the biggest challenge for parents who are racing the clock in a disaster is holding emotions in check. “You’re not going to be any good to your child if you take such great risk that you lose your life in the pursuit of attempting to save them when there are others who are onsite who hopefully will also use good judgment,” Stephens said. Simply showing up isn’t enough. “You want to have an entrance plan but also a completion plan. Can you make it out? Can you make it to safety?” he asked rhetorically. Officials at the Moore School District choose not to dismiss students early. But that, too, is a tough call. Troy Albert, a principal at Henryville Junior-Senior High in southeastern Indiana, let students out for the day on March 2, 2012, just moments before tornado sirens went off. No injuries were reported among the few staff, students and parents who remained at the school when a tornado packing 175 mph winds destroyed the building. School officials halted people from leaving only when they figured the tornado was within 10 minutes of hitting, fearing that wouldn’t allow enough time for people to make it to safety. With about 30-45 minutes of lead time on a potential tornado last year, Julie Hubbard jumped in her car and signed her son out of a Tennessee middle school ahead of the storm. Associated Press writers Tom Coyne in South Bend, Ind. ; Leanne Italie in New York; and Justin Juozapavicius in Tulsa, Okla., contributed to this report. Bully Punished with Bad Clothing. Unusual or Cruel? On Wednesday, a Murry, Utah-based woman named Ally Olsen, 41, discovered that her fiancé’s 10-year-old daughter, Kaylee, was bullying a classmate. Kaylee’s teacher had emailed Olsen, explaining that the girl had been teasing a student for the past three weeks because of how she dressed. As a result, the victim no longer wanted to come to school. Olsen said Kaylee was not apologetic so in lieu of grounding her which she felt “wouldn’t resonate” she turned to Facebook, asking friends for advice on how to handle the situation. By the next day, Olsen had a plan of action. She took her family, who regularly frequented thrift shops, to a local store, pretending it was a routine shopping trip. As Kaylee deemed various articles of clothing “ugly” and “embarrassing,” Olsen had her try them on as a joke, eventually telling the fourth-grader that she was purchasing the clothes for her as punishment. “I wanted Kaylee to truly experience the embarrassing feelings she had evoked in someone else by wearing clothes she felt self-conscious in,” says Olsen. “The goal wasn’t to select clothes that were cheap; it was to buy things that Kaylee herself said she hated.” Also, Olsen told Kaylee that she wasn’t going to force her to apologize to her classmate; her remorse had to be genuine. Although Kaylee cried, the next day she headed to school wearing one of the outfits under a coat that she had zipped up to her neck. “When she came home that afternoon, Kaylee said the kids laughed at her for wearing ‘pajamas.’ She also felt so guilty that she pulled her classmate aside and apologized for her behavior the previous day.” To solidify the punishment, Olsen snapped a photo of Kaylee wearing the outfit (her face was blurred to protect her identity) and posted it on Facebook. Shaming misbehaved children is hardly news and there’s no shortage of parents who turn to social media to post embarrassing photos of their kids or have them stand in the street holding handwritten signs apologizing for bad behavior. But where’s the line between a parent airing their family dirty laundry and being inappropriate? “On the one hand, it sounds like this mother’s heart was in the right place,” says Kirsten Filizetti, Ph.D. a San Diego-based psychologist. “She was trying to help this girl understand what she had done and teach her a life lesson. “However, parents should be careful about introducing shame and guilt onto kids as a form of punishment,” she says. According to Filizetti, a better plan of action may have been to sit down with the child and understand the motivations behind the bullying, then use that knowledge to expose him or her to children who are different from them. To further the learning lesson, it may also be wise to have the kid sit down with the peer they hurt and listen to how the behavior was hurtful. “It’s less important that the bully explain where they were coming from and more important that the victim feels heard,” she says. Parents Force Girl to Hold Sign as Punishment for Being Disrespectful. Tough Love or Too Much? Spanking Makes Aggressive, Depressed Kids? Christine C. Quinn, the City Council speaker and a Democratic candidate for mayor, revealed in The New York Times on Tuesday that she battled bulimia for over a decade, from her midteens until she entered a rehabilitation program at age 26. Though other public figures have discussed their struggles with bulimia – Katie Couric and Jane Fonda are two examples – it’s a rare disclosure for a politician. Ms. Quinn also said she considered herself a recovering alcoholic, which is a less unusual distinction. I’ve written about my own experience with anorexia, and edited a book of essays about anorexia and bulimia. Because of that, much of what Ms. Quinn told me in the course of two emotional interviews, including her shame and denial about her illness and how important it was to finally accept that she needed help to deal with it, was familiar. My experience also made me it easy for me to understand that Ms. Quinn’s bulimia was about much more than wanting to lose weight. Christine C. Quinn opened up about her bulimia and the alcoholism that accompanied it, which she will discuss at a speech at Barnard College and in a memoir to be published next month. In the last year or so, as Ms. Quinn has been gearing up for her campaign for mayor, she has talked about how she has lost 25 pounds through healthy eating and exercise. Her bulimia was something quite different, though, and quite a bit darker. A frequent and understandable misconceptionabout eating disorders is that they are simply an extreme and slightly dysfunctional form of dieting. Bulimia — which is characterized by bingeing and purging, usually by self-induced vomiting — is particularly misunderstood. When it’s invoked on television or in movies, it’s often a joke and a marker of superficiality: A character who is a model or an actress eats a normal meal and then disappears to the bathroom to throw it up. In real life, many people respond to the idea with disgust. Bulimia, like anorexia, begins with an effort to lose weight, but it only takes hold and becomes a serious illness if bingeing and purging start to fulfill an emotional need. In Ms. Quinn’s case, when she was 15, her mother was dying of cancer, and she shouldered more and more responsibility in her family. Her description of her family during the two interviews suggested that they had trouble talking about her mother’s illness and its consequences, including her mother’s heavy drinking. As it turned out, purging didn’t help Ms. Quinn lose weight, she said, but it did something more powerful: It gave her a sense of control over her out-of-control life and brought her a momentary relief from pain and stress. As she explained, though, the relief got briefer and briefer, which caused her to binge and purge more and more often, in an effort to recapture the feeling. Although the physiology is not well understood, researchers have compared the experience of bulimia to that of drug addiction. Some research suggests that people with bulimia have brain abnormalities similar to those of people who suffer from cocaine or alcohol addiction. What Ms. Quinn described about the feeling of relief becoming briefer is what is known in drug addictionas building tolerance. In my book, “Going Hungry,” one writer, Latria Graham, traced her bulimia in part to her parents’ fractious marriage. She was also a cutter. Cutting herself, she explained, offered her a form of relief from her roiling emotions like the relief from bingeing and purging. My own anorexia arose in a much less gothic context, out of more mundane conflicts. I first developed anorexia when I was 10. I had changed schools and was lonely and unhappy, and putting myself on a diet – though I was not fat – seemed like a sensible way to improve myself and perhaps fit in better. With the help of a doctor and a therapist, I regained weight by the time I entered high school (though not before missing my chance for a growth spurt). I relapsed in my freshman year of college. The immediate trigger was performing in a play in which I was to appear in my underwear. But, on a deeper level, I was struggling with adapting to college and with my inchoate ambitions, for which I had not yet found a productive outlet. So the outlet I chose was starving myself. Being hungry sharpened my concentration and made me feel capable of great intellectual feats; soon I was addicted to it. In the long run, though, as my body wasted, the high gave way to depression. As in Ms. Quinn’s case, the decision to seek inpatient treatment in my junior year of college, as difficult as it was, was critical in helping me recover. Now, at 33, I have been healthy for many years. Although therapy helped, I feel as if my career as a journalist played as important a role, since it finally gave me the outlet that I had been seeking. Ms. Quinn said that her need to be perfect drove her professionally, as well as contributing to her bulimia – and while she was still suffering from bulimia, her professional success was a solace. Over a long period, beginning with her time in rehab, she said, she let go of her need to be perfect, along with her guilt about her mother’s suffering and death. She said the final step in her healing was meeting Kim M. Catullo, who is now her wife. Marlene Castro knew the tall blonde woman only as Laurene, her mentor. They met every few weeks in a rough Silicon Valley neighborhood the year that Ms. Castro was applying to college, and they e-mailed often, bonding over conversations about Ms. Castro’s difficult childhood. Without Laurene’s help, Ms. Castro said, she might not have become the first person in her family to graduate from college. It was only later, when she was a freshman at University of California, Berkeley, that Ms. Castro read a news article and realized that Laurene was Silicon Valley royalty, the wife of Apple’s co-founder, Steven P. Jobs. “I just became 10 times more appreciative of her humility and how humble she was in working with us in East Palo Alto,” Ms. Castro said. The story, friends and colleagues say, is classic Laurene Powell Jobs. Famous because of her last name and fortune, she has always been private and publicity-averse. Her philanthropic work, especially on education causes like College Track, the college prep organization she helped found and through which she was Ms. Castro’s mentor, has been her priority and focus. Now, less than two years after Mr. Jobs’s death, Ms. Powell Jobs is becoming somewhat less private. She has tiptoed into the public sphere, pushing her agenda in education as well as global conservation, nutrition and immigration policy. Just last month, for example, she sat down for a rare television interview, discussing the immigration bill before Congress. She has also taken on new issues, like gun control. But she is doing it her way. “It’s not about getting any public recognition for her giving, it’s to help touch and transform individual lives,” said Laura Arrillaga-Andreessen, a philanthropist and lecturer on philanthropy at Stanford who has been close friends with Ms. Powell Jobs for two decades. She is also the daughter of a wealthy real estate developer in Silicon Valley and the wife of Marc Andreessen, the venture capitalist. While some people said Ms. Powell Jobs should have started a foundation in Mr. Jobs’s name after his death, she did not, nor has she increased her public giving. Instead, she has redoubled her commitment to Emerson Collective, the organization she formed about a decade ago to make grants and investments in education initiatives and, more recently, other areas. “In the broadest sense, we want to use our knowledge and our network and our relationships to try to affect the greatest amount of good,” Ms. Powell Jobs said in one of a series of interviews with The New York Times. Still, the fortune she inherited, making her the world’s ninth wealthiest woman, according to the Bloomberg billionaires index, has catapulted her into the upper echelon of global philanthropists. And that has led to certain expectations. Ms. Powell Jobs has a net worth estimated at $11.5 billion, according to Bloomberg, most of it in shares of the Walt Disney Company. Mr. Jobs helped found the animation studio Pixar, which Disney acquired in 2006 and paid for in stock. With 131 million shares, worth about $8.7 billion, the Laurene Powell Jobs Trust is Disney’s largest shareholder with a 7.3 percent stake in the company, and she has benefited from the stock having more than doubled since her husband died in October 2011. Mr. Jobs also owned 5.5 million shares of Apple at the time of his death, and it is unclear whether she has sold her position. Like many technology titans, her husband was criticized for not giving away as much money as he could. Mr. Jobs did not give publicly during his life — though there have been rumors of at least one major anonymous gift, to a hospital. Perfect moms are kind of like unicorns … they don’t exist. So instead of trying to fake it, I’ve decided to declare my mediocre parenting style a “philosophy” and shout it from the rooftops. I know, I know, they’re important for the “physical health” of your child and prevent things like Ricketts, rotten teeth and the distended stomachs that malnourished kids have on those food-famine programs. But here in the United States, children are not going to eat them until they’re at least 6 years old, maybe 7. Thank goodness for gummy vitamins. First off, it’s an excellent babysitter. Just let the kids watch episode after episode of iCarly and you can find time to Facebook-stalk, wipe after you pee or purge your closet of your husband’s ugliest clothes while he’s at work. Plus, it can teach new vocabulary words. Just the other day, my daughter wanted to know what a lesbian is after watching an episode of Glee. It’s OK to have your kids do some of the unsavory chores. My parents taught me this parenting principle, so you can thank them. Why weed the garden when you have children who constantly do naughty things and need some time to “think about what they did” while engaging in some manual labor in the backyard? Also, they wanted that damn cat—let them scoop the litter. We spend the first five years of a child’s life drilling into them that they need to share. And then as soon as we put them on a soccer field or in an Easter egg hunt, we’re all, “Get those little buggards!” Let’s just fast-forward a bit and use the time they spend in the time-out chair for more productive things, like watching TV or learning the difference between a flower and a weed. A strong desire for expensive things is character-building. I always tell my kids things like, “If you want a trampoline, be really nice to someone who has one, because I’m certainly not buying you one.” I really feel this will help shape them into kind, charming, likeable youths. Quality time with your child after 9 PM is unnecessary. All children, even the older ones, should disappear into their bedrooms by 8 or 9 PM. They don’t necessarily have to sleep, they just need to be quiet. They should probably go to bed earlier if they’re too young to watch reality TV or expect you to share all the good snacks. Keep in mind that you’ll appreciate them more in the morning if you’ve had a chance to miss them. Well-cooked food should only be served on holidays. When it comes to food preparation, keep your child’s expectations low. Why use an oven when you can use a microwave? Why get involved in activities that involve the use of terms such as “sauté,” “julienne” and “mince”? It’s just a time-consuming way to make a mess of your kitchen and only results in your children whining about the absence of the “nugget” food group on their plate. It’s OK to lie to your child when it’s going to save you time or effort. OK, “lie” may be too strong a word. But does your toddler really need to know that you’re not going to Chick-Fil-A because you’d rather go home, eat a microwaveable pizza and watch Modern Family? No. Those words are just an invitation for a tantrum. Just tell him that it’s Sunday and Chick-Fil-A is closed. You can think of a new lie once he figures out how to interpret a calendar. Always tell your kids you’re very, very poor. Don’t be that mom who thinks she’s the only one who knows how to care for the children and the house the right way. Well, it’s OK to think that, but play along so you can get a nap. Let Daddy bathe the baby, even if he fails to use soap. Let Grandma drive your daughter to dance class, even if she has no idea what “acro” means. It’s win-win: You’ll get some peace and quiet and earn the satisfaction of rolling your eyes at their mishaps later.